New York Post, Rolling Stone columnists bemoan the state of U.S. media. The last month or so of Trump-Hillary coverage may have been the worst stretch of pure journo-shilling we’ve seen since the run-up to the Iraq war. In terms of political media, there’s basically nothing left on the air except Trump-bashing or Hillary-bashing. Taibbi further frames his observations with some interesting thoughts about the National Review. 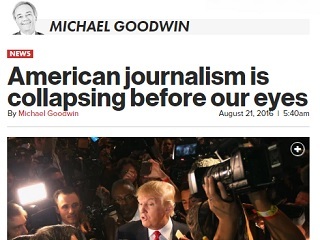 Read the rest of his piece here and Goodwin’s column here.